A few years ago A. J. Whitney supplied this site with a view of the distant village of Lovewell, photographed from the summit of one of its surrounding hills and looking like a sleepy New England hamlet. I surmised that the picture had once been a postcard, and while it was probably taken early in the 20th century, I hesitated to put an exact date on it. If I had been bolder I might have guessed 1909, the year Lovewell’s neighbor to the south, Formoso, published a promotional brochure to boast of its swift progress and perhaps encourage a fresh wave of eager arrivals. Ironically, after hitting an all-time high that year, Formoso’s population would settle into a long, slow downward trend. 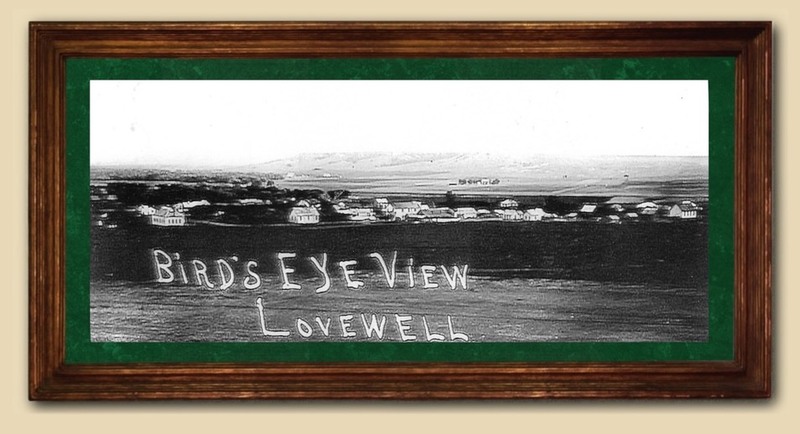 Was A. J.’s picture of Lovewell taken at her town’s zenith? As I’ve mentioned before, the largest and most impressive of the three pictures she provided seems to have been copied and re-photographed and filtered so many times that it has begun to resemble a lovely watercolor painting. That’s one of the reasons I thought it deserved to be displayed in a frame on these pages. The story behind this picture became a little clearer when Phil Thornton alerted me to some finely-detailed photographs on Rhoda Lovewell’s Facebook page, photos which turned out to have been borrowed from a site devoted to early-day Jewell County postcards maintained on Facebook by Curt Rafferty. The bulk of Curt’s collection seems to consist of views of Jewell City, the county’s earliest settlement of any size, and once a prime candidate to become the county seat. That prize was seized from its grasp by Jewell Center, later renamed Mankato to clear up any residual confusion. There are, happily for us, scenes of other historic towns in the collection, including a precious few of Lovewell in its prime. 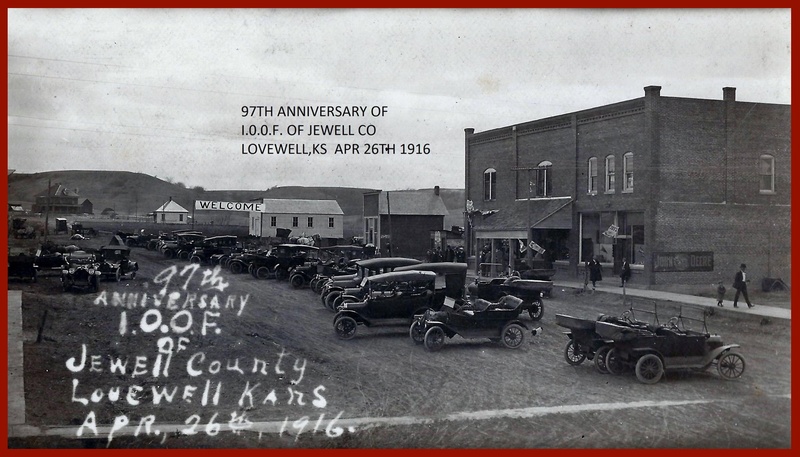 Lovewell’s prime, I’ve learned from items culled from local papers, probably occurred between 1913 and 1916, when it was heralded as the fastest-growing town in Jewell County. The jewel in the crown was apparently a large structure handsomely encased in manufactured brick that I looked for in those earlier pictures from A. J., but couldn’t spot. It’s hard to miss in the landscape of the newer photograph, along with about a dozen other houses, barns, and sheds that sprouted up in the foreground between the time the two photos were snapped from the same vantage point on a nearby hill, perhaps a decade apart. 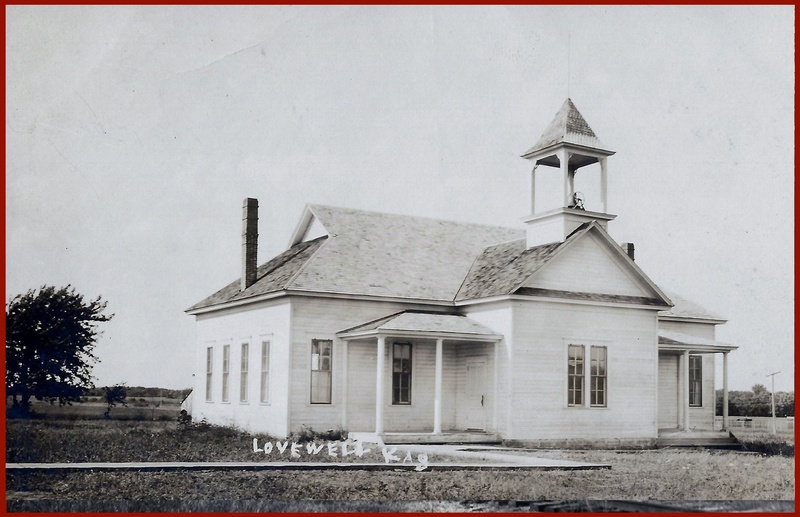 The newer one, along with pictures of a few other local landmarks, must have been taken around 1916 when Lovewell seemed destined to continue growing by leaps and bounds. While Ben Stofer’s new coupe may have drawn appreciative stares in 1913, as one of Curt’s postcards demonstrates, the automotive craze was in full bloom by 1916, when the 97th anniversary of the Independent Order of Odd Fellows drew a sizable crowd to the Lovewell business district, with no more than one or two visitors arriving in horse-drawn buggies or wagons. By 1916 the town must have remained proud of its attractive little school, which, while hardly imposing, was certainly a step up from the earlier one-room buildings such as School No. 97 at nearby Switzer’s gap. The historic railroad depot doesn’t seem to have been earmarked for a place of honor on a postcard that year. Motorcars were the future; railroads suddenly seemed antiquated. Fifty years later, when the depot was truly on the endangered list, it may have been considered worth celebrating as a quaint relic of bygone days. The commemeration came in the nick of time. 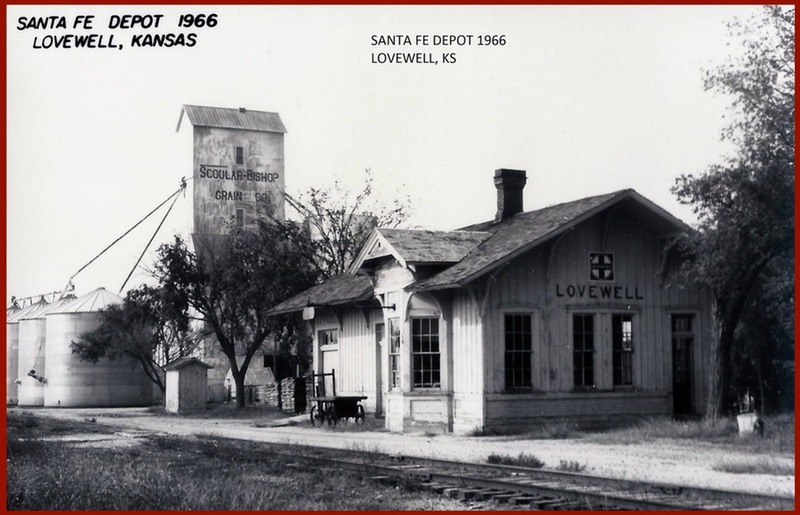 In 1968 the Santa Fe Railroad would ask the Kansas Corporation Commission for permission to close the Lovewell depot, and by doing so, close the book on Lovewell. The many automobiles parked in front of the I. O. O. F. Hall in the picture shown at the middle of this page must have been seen as a sign of progress in 1916, but they were also a harbinger of the downhill slide to come. At that very moment a series of “Good Roads” meetings were laying out preliminary plans and gathering input from fledgling motorists around the country. When the resulting route for the Pikes Peak Ocean-to-Ocean Highway (better known as Highway 36) was unveiled, Lovewell’s boom was suddenly at an end. The smoothest road in the region would miss the town by five miles, running rougly congruent with a trail that had been known 60 years earlier as the Parallel Road, once intended as a highway that would usher prospectors from Atchison to Pikes Peak. With the Pikes Peak Ocean-to-Ocean Highway scheduled to intersect with the north-south Meridian Highway just a few miles away at Belleville, in the future it was going to be hard to keep anyone at home.